Okay, I already hear the question: How can I “know” I will be cured? Simple. Do you want to be cured? Then decide that you are going to get what you want and decide that you will put up with whatever you have to put up with in order to achieve your cure. Simple…in theory. Difficult in practice. Why? Because Parkinson’s is a symptom of your life out of balance, and until you restore balance to your life, the symptom called Parkinson’s will remain with you as a reminder that you have more work to do. Knowing in your heart you will be cured. In the beginning of my journey, I knew I would be cured one day. Sally knew it, too. I have asked my children if they ever thought I was afraid I would not be cured or ever thought I was concerned that the increasing symptoms meant I was getting worse. They all had a similar response: that I was so confident in my recovery, never showing fear of Parkinson’s or concern over increasing symptoms, and as a result, they were completely confident in my recovery as well. My fears were in two places: 1. That the known path my mother had followed resulted in her being crippled in a wheelchair with barely any voice to speak, and that the Alzheimer’s and Dementia from 20+ years on medications had rendered her mindless three years before she died; and 2. Life. Fear of not being perfect enough or having all of the right answers or making everybody else happy or being in control of everything…. As you can see, fear of Parkinson’s was a luxury I could not afford. So what choice did I have? Decide I would cure myself and chart my own course…fearlessly! Was my life out of balance at that point in time? Absolutely yes! (They call it Parkinson’s). Is your life out of balance at this current point in time? If you have Parkinson’s, then absolutely yes! If you cannot stand up straight and walk like you did pre-Parkinson’s, then physically you are out of balance. If you are suffering from tremors (shaking), rigidity (stiffness), Bradykinesia (slowness), and/or fatigue, then physically you are out of balance. If you are suffering from constipation, urgent urination, and/or chronic indigestion, then physically you are out of balance. If you think that you need to be perfect in all things, then mentally you are out of balance. If you think you have to control everything going on in life including, but not limited to, all the other people’s happiness and feelings in general, then mentally you are out of balance. If you cannot accept something you do not like when it is happening in the moment and you respond to it with the emotions of anger, frustration, resentment, stress, anxiety, worry, and/or fear and you are consumed by those emotions, then mentally you are out of balance. If you love God, but you think that God does not love you, then spiritually you are out of balance. If pre-Parkinson’s and/or now you did/do things unconditionally for others, but even in your physically debilitated current Parkinson’s body you are unable to fully and open-heartedly accept others unconditionally doing things for you because you do not love yourself or find yourself worthy, then spiritually you are out of balance. If, instead of being in the present moment of what is going on in your life, you are looking at the past with regret and guilt instead of acceptance, and you are looking at the future with fear instead of faith, then spiritually you are out of balance. As you can see, Parkinson’s is a symptom, a manifestation, of all of these imbalances in your life. Why does it manifest in such harsh physical symptoms? 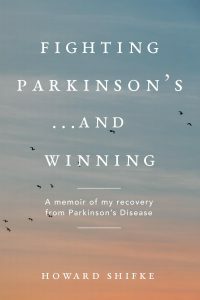 I will be the first one to step up and answer (admit) this one: Because if Parkinson’s did not provide me physical symptoms that lasted until the day of my cure, I would not have fixed the physical, mental, and spiritual imbalances in my life. I lacked the understanding and motivation to change. I had become the old me. It is what worked in my life, so I thought. I had to admit to myself that I was out of balance in my life. Did I do it on purpose? Of course not. It happened while I was living life that way I thought life was supposed to be lived. There is no shame, no blame, no finger-pointing, no fault, no guilt in getting Parkinson’s. I knew the way I thought and felt had to change because the way I was thinking and feeling had helped me get Parkinson’s. So, I decided to do what was the complete opposite of how I thought and felt…I decided with full faith and no fear that I would cure myself from an incurable disease and I would tolerate whatever it had in store for me along the way, and that I would do it day-by-day, moment-by-moment, in the present, here and now. For me, that was anti-Howard, the Howard I had become. I knew it would work. And, how did I restore balance to my life? By doing the Parkinson’s Recipe for Recovery® day-by-day, moment-by-moment, staying in the present. And, how will you restore balance to your life? By doing the Parkinson’s Recipe for Recovery® day-by-day, moment-by-moment, staying in the present. And be patient. The journey you are on is life. When you cross the final finish line in your life, it is death. I haven’t heard one person say they are in a hurry to reach the final finish line in life. Slow down, and please be patient and enjoy the journey of life. Feel your recovery in your zest to be alive, in the joy in your heart, in your compassion for yourself and others, in your love for yourself and others. And be grateful. It changed my life the day I became grateful for being alive, even in a Parkinson’s body. I cherished the breath of life and was grateful. I still am. Know in your heart you will be cured. Do the Recipe. Make it happen. Be your own cure! What you wrote is so wise, loving and true. You are a gift to our lives! Great post my friend. I totally believe in my heart that I will recover. WHEN lol is the challenge. Lol. My new attitude is that I have an amazing intelligence within me that knows exactly what it is doing, so I am stepping out of its way. If physically, I am stuck, slow, stiff, extra shakey right now, well it is just the way my body is coping right now, it is necessary for my healing. I’m DOING GREAT! I am exercising Patience and Compassion with myself and others. I equally TRUST that I am going to have full recovery exactly when I am meant to. This is just a part of my journey, it’s NOT my life. Finding Joy as I heal is my goal right now, my Life is Now, not when this disease gives up on me. It’s like when we set out on a drive to a new destination, we don’t turn back just because we can’t SEE the destination, we TRUST our car, our shiney teapot, will get us there. Big Love to Everyone. With Love & Gratitude to you Coach. Thanks Karen, I love reading your posts . Ps. Debbie thank you for your poem of 30th of December to me. Only saw it the other day as was re-reading Decembers posts. I know that I have to change, leave my old me in the past and become a new me. Cheers Lohren, delighted you have had a breakthrough in communicating with your dad. Death is merely a veil. I bet he was thrilled to hear your words. With you in spirit on our journey. I am so thankful to Howard and for his November Gratitude Challenge. I decided to write down 10 things a day that I was grateful for during the month of November. It changed my life and like Howard, I now cherish the breath of life. I am grateful to be me and to be alive. It helped me to start living in the moment, to realize and to enjoy all the many miracles that were taking place every second of my life. It helped me to know that I am getting better, and that I can enjoy this beautiful journey. I would like to share one of my November posts that depict these wonderful feelings of Recovery to me. P.S. Thanks to all of you who share yourselves and your journey with me. You are some of my many blessings and miracles of which I am grateful. Thanks to Howard for showing me the way ! This morning while sitting quietly out on my deck enjoying the moment, I became keenly aware of the billions of awe inspiring blessings which were taking place just for me to enjoy that moment in time. I am profoundly grateful for each of these blessing that come together each and every minute of my life. Listing ten things is simply like dropping ten drops of water in a very big ocean. 241. I am grateful for the quite when all the world seems to be asleep. 242. I am grateful for the feel of cool fresh clean air on my face. 243. I am grateful for the warmth of my (Ryan’s) jacket keeping in the comfort of my own body heat. 244. I am grateful for the sound of the rain as it beats down on the earth and bounces off the roof above me. 245. I am grateful for the distant sound of contented cows out on our green rolling hills. 246. I am grateful for the powerful sound of thunder as it rumbles over head. 247. I am grateful for the smell of rain and the wet dark earth that surrounds me. 248. I am grateful for the sweet sound of birds as they joyously bring in the new day. 249. I am grateful for my breath as it constantly and effortlessly breathes in and out. 250. I am grateful for my ability to recognize, savory and then to safely store this flawless moment in time; only to have it followed by another moment filled with just as many miraculous miracles. I love your gratitude list, it sounds like you have really changed your inner voice – well done! I am doing the same thing; it’s hard to be consistent but hey, like Howard says, we don’t even have to be perfect! I am firmly convinced that this journey would not be possible without the encouragement and comraderie we find here. Thanx to all, including, you, Howard! Big love! Wow Debbie, I love your gratitude list. You are a very poetic writer. I am going to start my gratitude list again, you have given me food for thought! I always love what you write, but today I LOVE how you put together today’s post. Being a list person, how instructional and satisfying it is to have you list examples of imbalances categorized by type. It all serves to make sense out of this complicated condition called Parkinson’s. For me it points to specific and very real reasons why I am still experiencing severe symptoms. It also gives me great hope as I note the imbalances I have already fixed, thanks to your dedicated and insightful counsel. I am coming to see the importance of living day by day, moment by moment, staying in the present. I am starting to shed my fear and anxiety when I think of the future. In faith, I purpose to let go of trying to control tomorrow. If it was your intent to help us “know” that we will be cured, you succeeded with me. Thank you for the beautiful explanation you posted today. There are a myriad of concepts, but they’re all consistent. Keep drilling us! And to all the friends around the world on this same journey, I thank you for sharing and encouraging with your comments. I look forward to crossing the finish line together with many of you! Love and happiness in 2015, one day at a time. Thanks for your post. My favorite part is ” I purpose to quite trying to control tomorrow.” I too purpose to quite trying to control tomorrow. Have a wonderful day. Once again Howard, thank you. You hit the nail on the head every time. I am practising gratitude and am beginning to see that it’s the petty irritations (little foxes) that tend to trip me up as often I’m not even aware of them, but thanks to you I am becoming more aware that I can get quite easily irritated. I am very thankful that I am able to share this. I’m so enjoying these posts and the sense of community and inspiration they invariably bring….almost as if we are all members of a giant symphony orchestra… a breathtakingly beautiful orchestra empowered and liberated by ourselves and each other …. and singing the song of infinite possibility. Thanks, Howard for being such an amazing conductor. What a beautiful, inspiring way to look at all these beautiful posts. Thank you Howard, so much.